Mensusa https://www.mensusa.com/articles/dress-cool-and-decent-in-the-blue-velvet-blazer.html Dress Cool And Decent In The Blue Velvet Blazer The key to stunning in party wear attires lies within the blue velvet blazer, party blazers men, or other mens velvet blazer that embraces the party mood. Is it a fun night out with friends, or alone, but have no idea of what to wear to create a high-end appeal? Well, there are those eminent party attire to consider; ideal for rocking any party with fashion and style. For example, a blue velvet blazer creates a fresh and classy charm and is suitable for both formal and semi-formal parties. men's velvet blazers are a perfect choice of party attire since it does not constrain on professionalism, but also a laid-back classy look. This depends on your combination of dressing, for instance a velvet jacket add-on with jeans gives out a young, semi-formal look to the seniors, while a combo with blue dress pants and a button-down shirt and a tie gives out a stylish business professional look. The latter is a neat outfit for formal parties. The blue velvet blazer radiates a strong and powerful imprint of their cool and peaceful look. You can style it with a button down shirt and a pair of dress pants to bring out a formal look for any formal party. 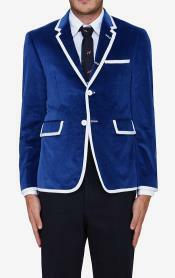 The blue blazer comes in various shades such as navy blue, hence creating different appeals for each shade. The blazer is available at mensusa.com in various designs,brands, and styles. You can style up for parties with a custom tailored double button velvet jacket, or create a calm aura with an open single breasted velvet jacket. The blue sport jackets can also be custom tailored to fit your requirements and shipped to your location, at a pocket friendly price tag from our online outlet. Party blazers men's are available in different brands and types. Whatever the special occasion or party, a party blazer is an ideal wear that enables you to create the appeal of a high-end fashion. Check blazers finishes off a combination of denim and T-shirt with a classy touch, hence stealing every heart at your vicinity. Whether a formal occasion or a wedding party, our outlets will give you the look you are looking for. 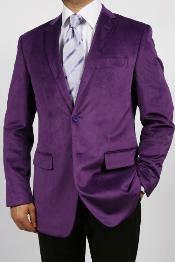 You can choose from a broad range of party blazers men's with different styles in our store. We have blazers with upbeat hues to spice up your wardrobe, and also those with long sleeves, notched lapels, buttoned cuffs and flap pocket blazers are all in store. men's velvet blazers are available in different types, materials, brands and myriad of colors to match up the class and style for any special occasion or party. Accessorize a velvet jacket with a Tee and jeans ensemble to give out a simple, elegant look. Our store features these blazers in different party velvet blazer brands, designs and colours, made with superior workmanship to suit your stature, color ,and taste. 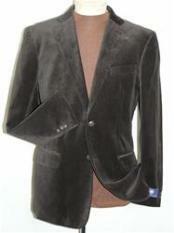 You should consider your wardrobe collection before deciding the color of your new velvet blazer. For instance, if you have lots of black or navy colored pants and blue denim trousers, then a gray blazer will greatly complement your collection. Why Velvet blazer would your perfect fit? One advantage that velvet blazer have on other outfits is its flexible style, which allows you to change through occasions without the need to rush home to change. You can wear a velvet jacket, with a tie and black dress pants to work. Then later on after work, you can ditch the tie and put on denim trousers for a fun night out. A velvet blazer color has no limits. All you have to consider is what color will complement your current wardrobe. For example, if your current closet has lots of grays and dark wash jeans; a subtle shade of blue is a perfect color selection of a velvet blazer to liven your present collection. Be it single- or double-breasted, with lapels or without, Double vent or single vent velvet blazers, you are at the right destination. The Blazers feature excellently tailored fabrics that offer comfort and style. Regardless of the occasion, you are guaranteed of a fun evening or special occasion with an ensemble that accessorizes a velvet blazer. Don't get stuck on deciding what to wear for any party, just give a try of a modern, fashionable look with any of the above mentioned party attires. Our store collection comprises of quality brands to ensure our customers get the most gain out of their purchases. Give in, come and browse through our party attire collection and select a choice to spice up your closet and for that ultimate look for any semi-formal occasions.